I have started printing with ABS this week using the UM3, and I am having a fantastic experience, when comparing with PLA, since the print goes smoothly from beginning to end. 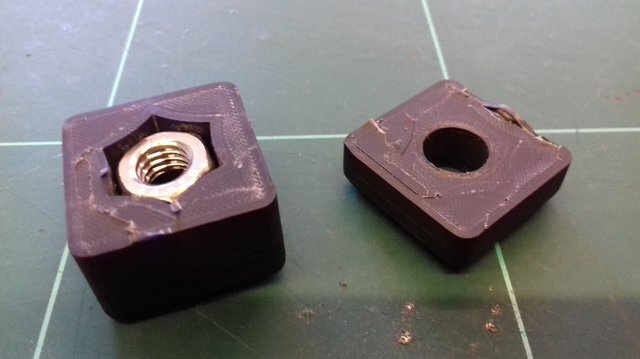 In the middle of the test pieces I'm printing, I want to introduce a metal nut, so the first prints I'm doing in the lab are tests of small cubes with the space to fit the metal pieces. (Problem 3) I'm having some issues with the new version of Cura. I am unable to perform a XY calibration. When I select that task, everything goes well, but the filament is not pulled and the extruder just goes around without actually releasing material. Don't know if that's a bug of the latest firmware or Cura, but it never happened before until now. 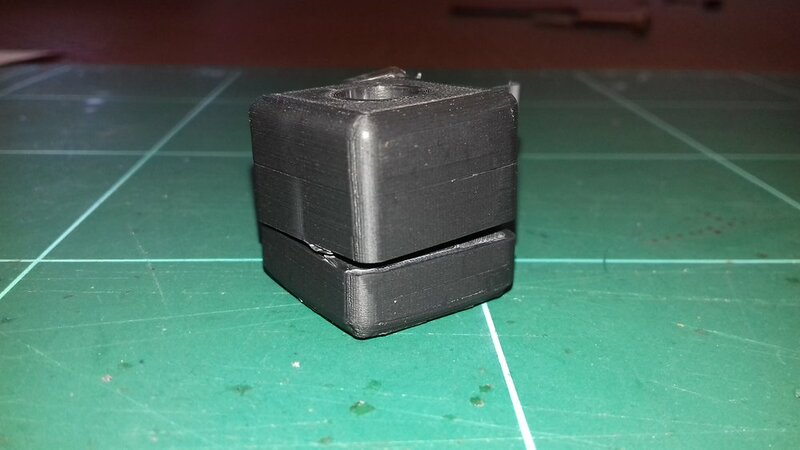 Also, I'm having a lot of trouble to connect Cura to my printer, and turn the camera on. The service is very inconstant and sometimes I can use it without problems, and others I can't do anything. To problem 1: ABS ist known for a weeker layer-adhesion (and weeker layer-to-layer-strength) than other materials like PLA etc. I know some users change the printing parameters (temp., speed?) to improve the layer-to-layer bonding. Possibly one of them is in this forum? To problem 2: I use the Ultimaker Adhesion Sheets on the glassbed of my UM3 and have nearly no problems with warping (but sometimes with week layer-to-layer strength, while i use the Ultimaker / Cura approved default settings). And they can be used SEVERAL times till they need to be changed. ... by the way: a front door (like the one in the Advanced 3D Printing Kit from Ultimaker) is highly recommended for successful printing with ABS. 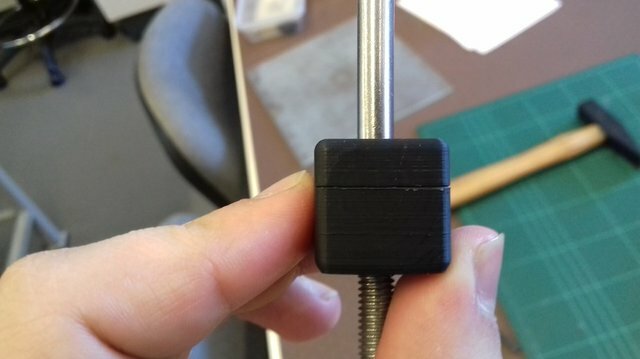 I have read a lot about how to print with ABS, and none of the tips solved my problem... 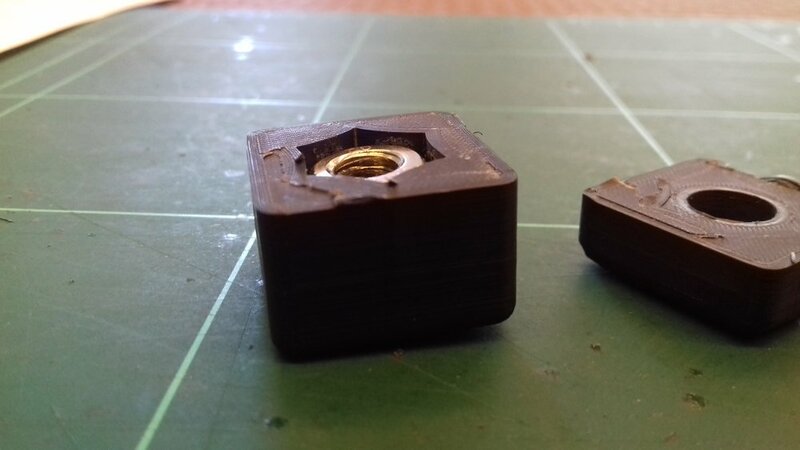 I have changed the temperature, on the extruder and the plate, and it did not solved it yet. I always lower the print speed so that the pieces come out better. My printer also has a door. However, there is always a layer that comes out with a flaw, and it is coincident with the end of the hexagonal indentation of the metal nut (not the beginning, it is always the layer that has a higher Z coord). This time, the piece came out like the ones in the images in this comment. What if you print this in PLA? 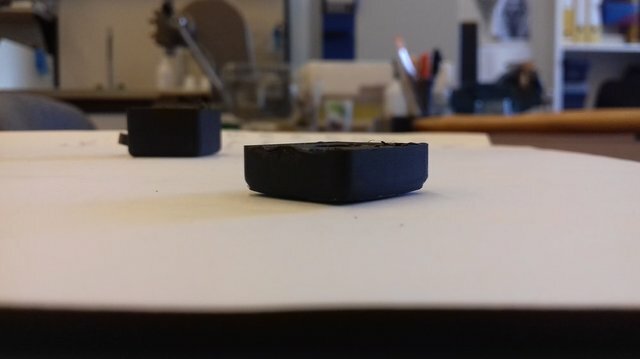 Does it come out right, or does it also have the same visual defect at the same height (although it might not break due to better bonding)? And what if you print this on its side? Does it then have a defect at the same height above the build plate (which could indicate a problem with the Z-axis), or does it have the same defect now running vertically (indicating a model defect)? 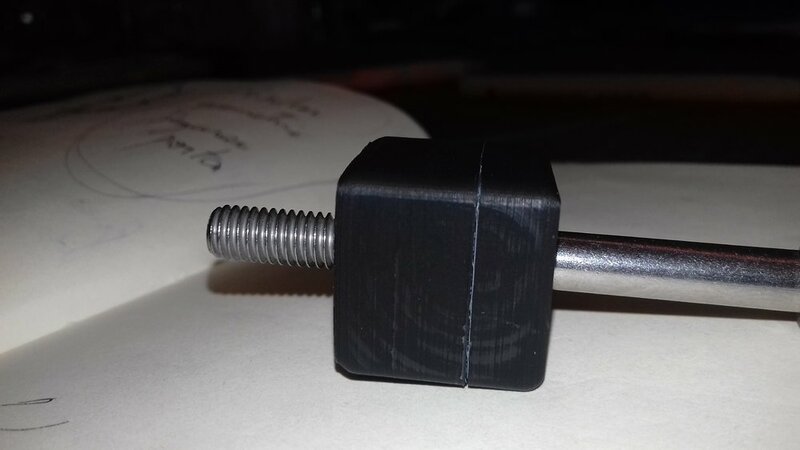 When moved manually, does the build-plate or Z-axis move smoothly up and down, without hard, stuck points? Is the bottom of this model open, so you can insert the nut from the bottom? Or did you pause the print halfway, move the head away, insert the nut, and then continued printing? If so, I could imagine this has some influence. Do all print-settings (perimeter, infill) have the same speed, temp and other settings?